Samsung is ready to unveil the next iteration in its A series this year. We already know that Samsung is launching the Galaxy S10 lineup on February 20. As per sources, full specifications and details of the Galaxy A10, Galaxy A30 and Galaxy A50 are available now. Read on to find out more about the much-awaited A series. The Galaxy A10 will be available with a plastic body, and a 6.2-inch Infinity-V display with HD+ resolution. The device will have a 5 MP front facing camera, and a 13 MP primary camera. The phone will pack the Exynos 7884B chipset with an octa-core CPU clocked at 1.6GHz. The handset will have 3GB of RAM and 32 GB of internal storage. The Galaxy A10 will not have a fingerprint sensor, so it will rely on Face Unlock and older security mechanisms. The device will have dual SIM card slots, with a dedicated microSD card slot. The smartphone will be powered by a 4,000 mAh battery. Surprisingly, the Galaxy A10 will ‘still’ retain a micro USB port. The phone’s dimensions are 155.6×75.6×7.94 mm, and the A10 will launch in 2 colours, Black & Gold. The Samsung Galaxy A30 will sport a glossy plastic body, with a 6.4 inch Super AMOLED display and a full HD+ resolution. The phone boasts of an Infinity-U design and the Always-on display. 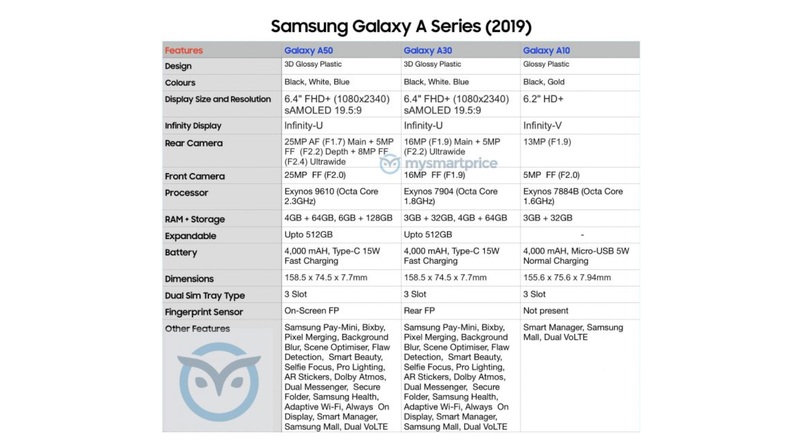 The Galaxy A30 will have a 16MP primary sensor with f/1.9 aperture and a 5MP ultra-wide camera with f/2.2 aperture. As for the front camera, the device will have a 16 MP (f/1.9) selfie shooter. The camera on the device will also support a ton of other features like AR Stickers, Background Blur & Pro Lighting. The device will run on the Exynos 7904 chipset, with an octa-core CPU clocked at 1.8 GHz. The device will be launched in two variants, a 3GB+32GB version, and a 4GB+64GB variant. 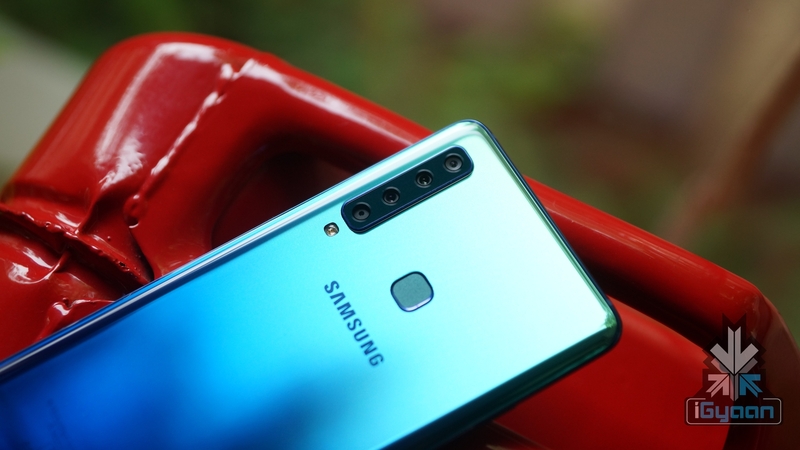 The Samsung Galaxy A30 will feature memory expansion up to 512GB, a similar dual SIM card slot to the Galaxy A10 and a USB Type-C port. The smartphone will pack a 4,000 mAh battery, and will also support 15W fast charging. 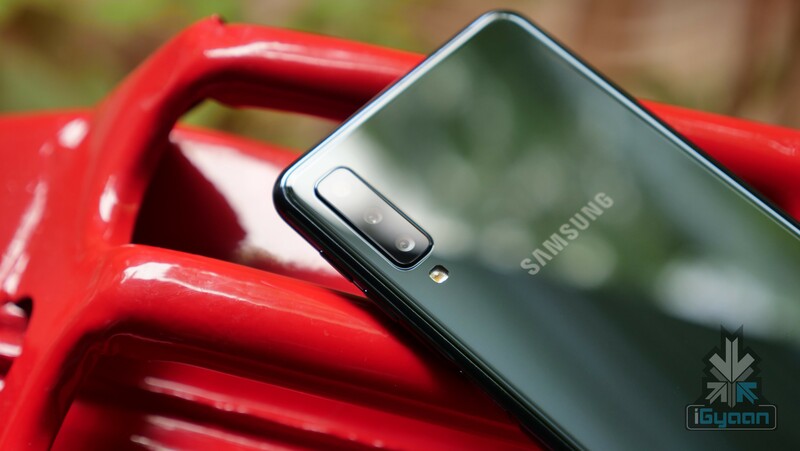 Unlike the A10, the Samsung Galaxy A30 will have a rear-facing fingerprint sensor and Bixby support. The device measures 158.5×74.5×7.7 mm, and will be available in three colours, Black, Blue & White. 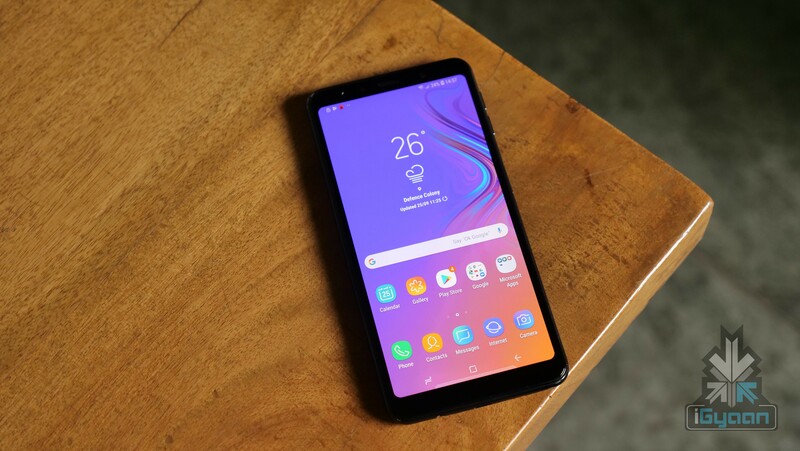 The Samsung Galaxy A50 is the top variant out of the three devices in the new A series. The highlighting feature of this smartphone will be its in-display fingerprint sensor, which is the norm for any high-end smartphone these days. It will have a triple camera setup on the back, and a 25 MP front facing selfie camera. The triple camera setup would consist of a 25MP main sensor with f/1.7 aperture, a 5MP depth sensor, and an 8MP fixed-focus ultra-wide camera with f/2.4 aperture. The Galaxy A50 will be kitted with the Exynos 9610 chipset, and will be available in two different variants, a 4GB RAM+64GB version and a 6GB RAM+128GB variant. It will have similar features to the Samsung Galaxy A30.